Raising vegetables in a square foot garden can be a great way to grow produce in a small space. In 2016, master gardener volunteers planted a square foot garden in their Small Fruits and Vegetables Demonstration Garden. The set-up followed the expertise of Mel Bartholemew set out in his "Square Foot Gardening" books. These three pictures of the "Square Foot Garden" were taken on October 25, 2016, showing plants still growing because a killing frost has yet to occur. 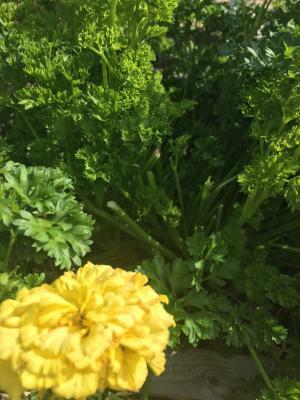 Curly parsley and yellow marigolds are a nice compliment to each other. 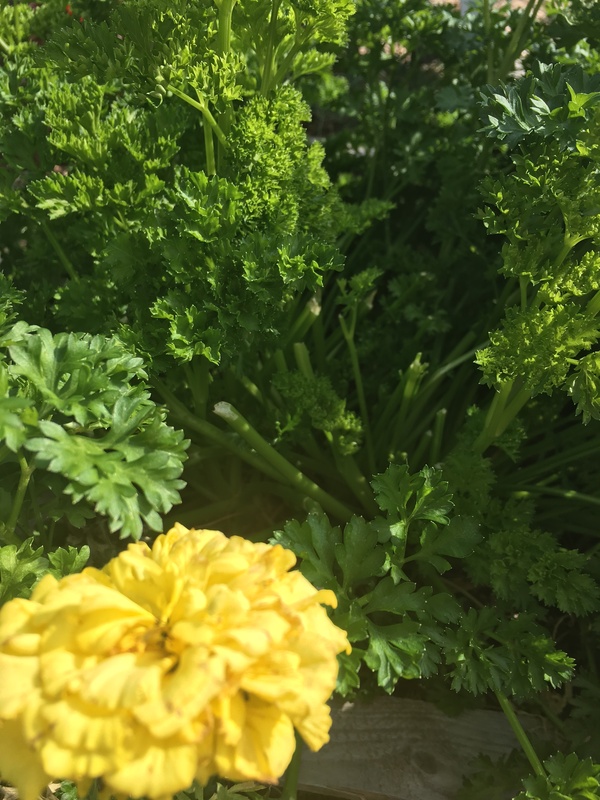 Curly parsley, Petroselinium crispum, grows 8 to 14 inches tall in a sunny location with well-drained soil. This biennial plant is host to the eastern black swallowtail larva. 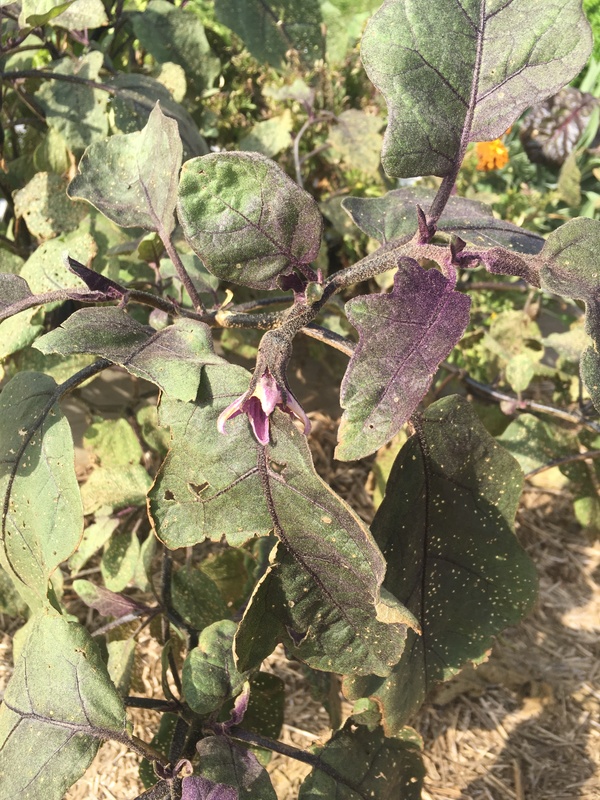 The 'Ichiban' eggplant has been a great producer of 10" long, purplish-black Japanese style eggplant throughout the summer. The plant grows 3' tall and about the same width. 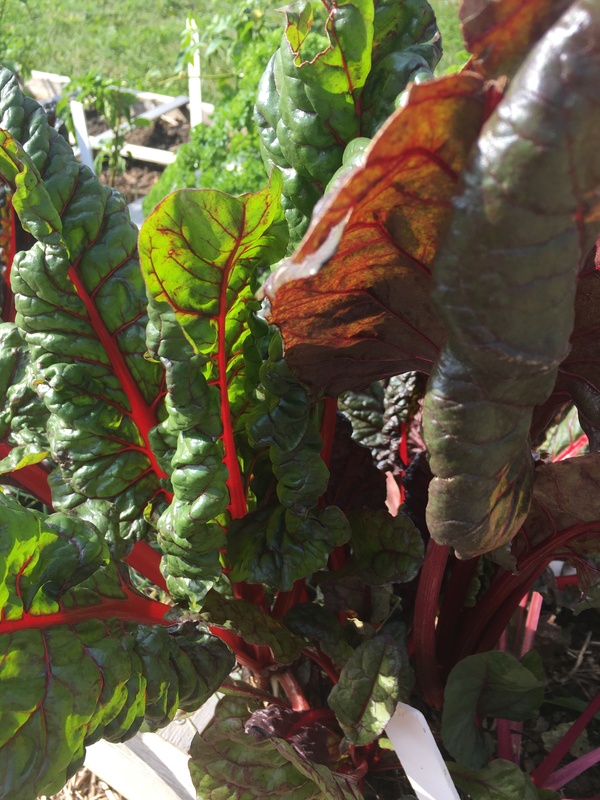 'Bright Lights' Swiss Chard, an All- America selection, has consistently produced throughout the summer and fall seasons. This plant gets its name from varying stem colors of gold, pink, orange, purple, red and white. Bright Lights strong bolt resistance produces well throughout the summer. The leaves can be eaten raw or cooked. This initial year of the "Square Foot Garden" has been a learning experience. Next season volunteers will adapt plantings based on what was learned this year. University of Illinois Extension Master Gardener volunteers showcase several types of small fruits, tree fruits and vegetables in this garden which is located in front of the U of I Extension Building, 700 S. Airport Drive, Springfield.